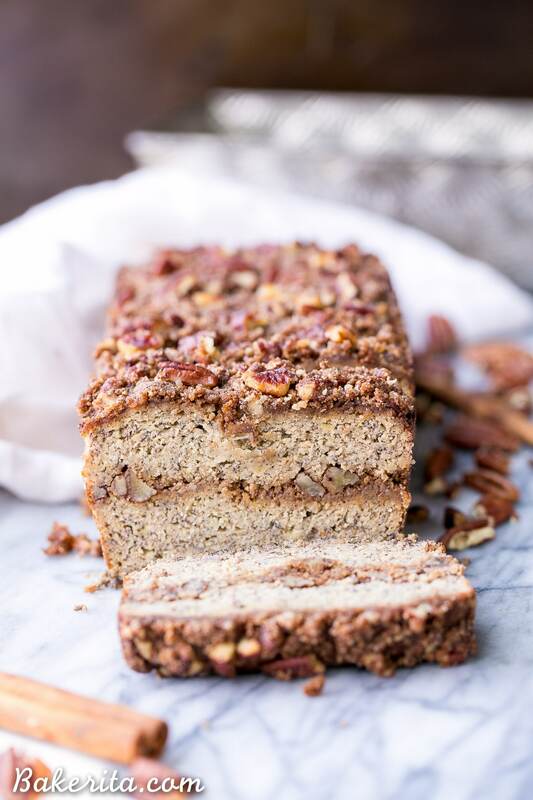 This Paleo Cinnamon Streusel Banana Bread has a layer of pecan crumble in the center and on top, creating a ripple of cinnamon flavor throughout the whole loaf of banana bread. 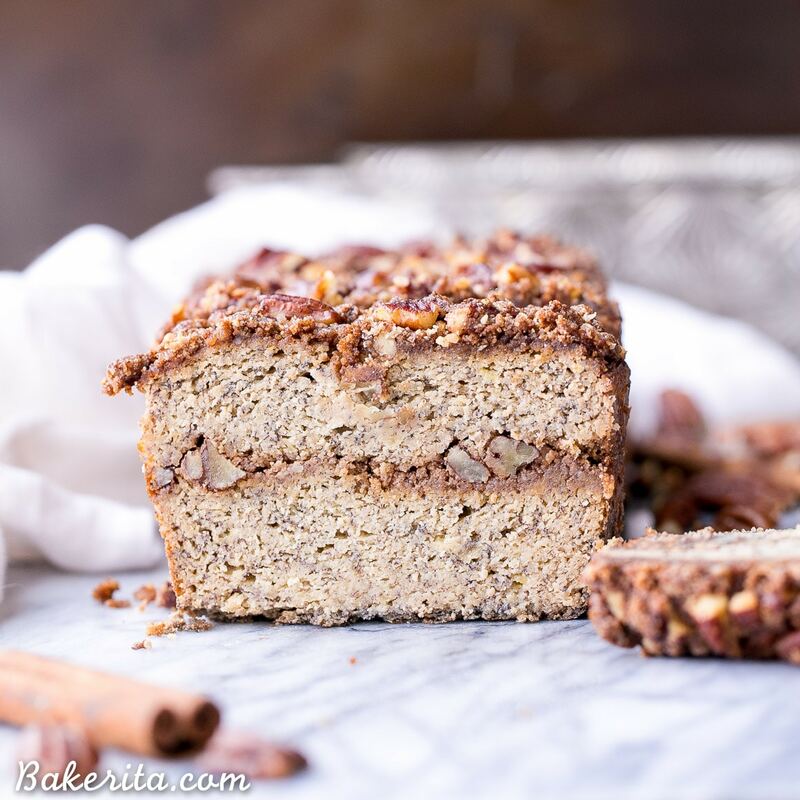 This moist gluten-free + refined sugar free bread is sweetened with bananas and made with coconut flour. Sooo, last weekend, I finished my first Whole30! And to be honest, it wasn’t nearly as hard as I thought it was going to be – I learned a lot about my food habits, and also managed to change a lot of them for the better. I feel a little bit spoiled because since I work from home, meal prepping wasn’t as necessary for me as it is for so many people. I made a whole bunch of delicious meals from some of my favorite bloggers, and actually learned how to be a much better cook using way healthier ingredients. Progress! I’ve been considering doing a big post about my Whole30 experience, and linking to all the recipes I’ve tried…let me know if that’s something you’d like to see! In post-Whole30 news though…I can finally eat baked goods. And that means I can finally MAKE them again! I’ve been compiling quite the compilation of recipes I’ve wanted to make, but none of them have been compliant so they’ve been sitting idly in my computer. But now, the time has come, so baked goods are coming back atcha full force…although I’ll still be throwing in some nut butters, my favorite Whole30 recipe go-to :) and the first baked good up? This Paleo Cinnamon Streusel Banana Bread! It’s no secret I’m a huge fan of banana bread, as evidenced by the number of banana bread recipes I’ve posted over the years (case in point: paleo chocolate chunk banana bread, paleo double chocolate banana bread, paleo almond banana bread, secretly healthy gluten-free banana bread). While they’re all delicious, this cinnamon streusel version just might be my new favorite. I go nuts for anything with streusel or anything with pecans, and this pecan streusel covers both of those bases. It’s super simple to throw together and with a thick layer of it in the middle and on top of the banana bread, it makes for an irresistible loaf. This recipe uses just half a cup of coconut flour, which can’t be substituted with anything else because coconut flour is uniquely absorbent, which is why you need such a small amount for the whole loaf. Nut butter also provides some structure and flavor – I tested this recipe with both cashew butter and almond butter and both were delicious! Whichever you prefer or is more accessible to you will do the trick. 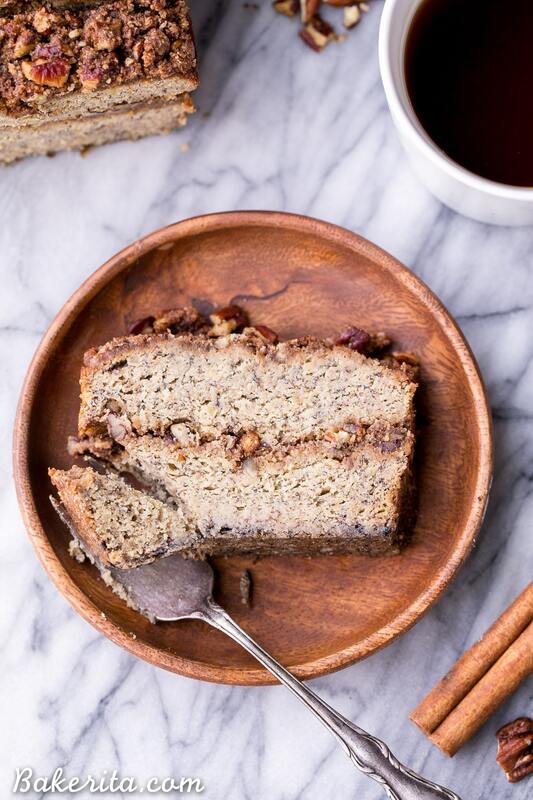 There’s also NO added sugar to the banana bread – it’s sweetened entirely with the ripe bananas, and there’s only 1/4 cup coconut sugar in the streusel topping. Hard to beat that! 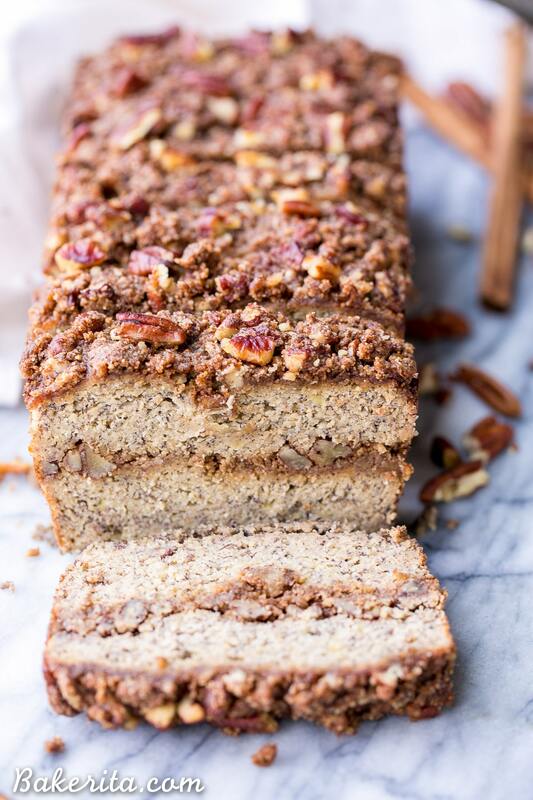 This paleo cinnamon streusel banana bread is super soft, moist, and absolutely delicious. It’s full of cinnamon and sweet banana flavor, with that irresistible layer of pecan streusel throughout. It also freezes incredibly well, so you can slice it before freezing and heat up slices as you want them. Enjoy! First, prepare the streusel. In a small bowl, stir together all of the streusel ingredients until fully moistened and crumb-y. Place in the fridge while preparing the batter. Add the coconut flour, cinnamon, baking soda, baking powder, and sea salt to the wet ingredients and mix well. Pour half of the batter into the prepared pan and spread it evenly. Sprinkle half of the streusel evenly over the batter. Cover with the remainder of the banana bread batter, and then sprinkle the rest of the streusel topping evenly over the top. Bake in the preheated oven for 50-60 minutes. A toothpick inserted into the center should come out clean. Store leftovers wrapped in the refrigerator, or freeze for longer term storage. Yay for finishing Whole30! I’ve thought about doing that, but I think it would be really hard for me to give up coffee haha. This banana bread looks so good, Rachel! I love the layer of cinnamon streusel inside, so pretty! You don’t have to give up coffee on Whole30, Gayle! You just have to drink it black or with compliant almond milk :) I think a lot less people would do it if coffee was a no-go, haha! Thanks so much for the love. Congrats on finishing your first round or Whole30 successfully! I’m going to do it in April, nervous but excited! Holy heavens, this banana bread not only has streusel on the top but in the middle? Talk about banana bread perfection! You’ve got it, girl! It was pretty manageable, and I’m sure you’ll do great. Thanks for the banana bread love! That streusel!!!! I have to watch myself around that stuff because I love it so much. I’m glad that you put DOUBLE streusel in there. My kinda bread. I adore streusel too!! Thanks so much Annie. Congrats on a successful Whole30! I agree that working from home eliminates the “prep” problem and makes it really easy to experiment with new recipes and learn some new cooking techniques. As for this bread, I want to wake up to it everyday! Banana bread and cinnamon streusel combined is a dream! Many congratulations on finishing your first Whole30. 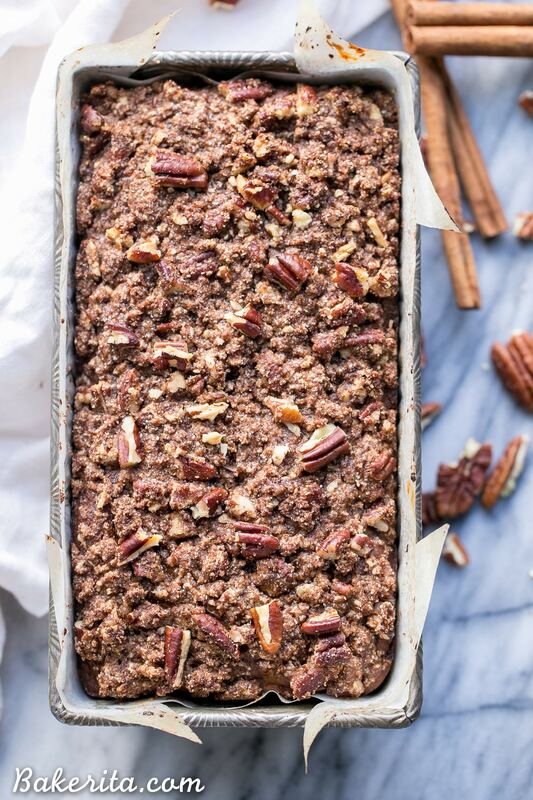 This paleo cinnamon streusel banana bread with a layer of pecan crumble sounds fantastic. Love the fact this is sweetened with bananas and made with coconut flour. So much yes to this. Congrats on finishing the Whole 30! And this bread is just mouthwatering – it would have me bounding out of bed for breakfast!! I can’t wait to try this recipe- wish I still had bananas in the freezer! Yes, I’d be very interested in your fave recipes while doing Whole30 (and congrats for finishing!). 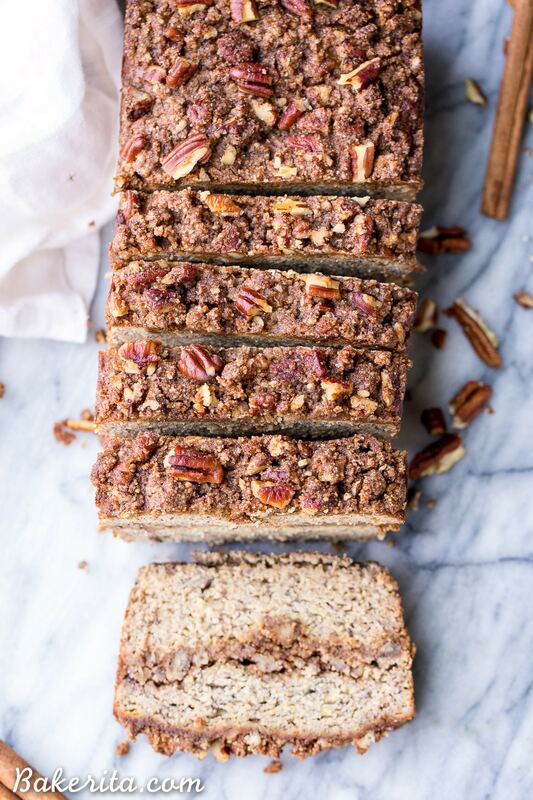 I did it last month and am looking for more Whole and clean recipes to keep in the mix…along with your pecan struesel banana bread! I’ll definitely start writing that post up then! Thanks so much Cindy, hope you can find some delicious recipes you love around here. Love all of that streusel! Wish I had a slice to go with my coffee! This looks amazing, Rachel! I’ve actually never made anything with streusel, but I just might have to now. An I would LOVE to see a post about your Whole 30 experience with links to the recipes you used! I’m starting to get the post together now! Thanks so much, Monica. This looks so moist and perfect! I can’t wait to make it! Sooooo good!! I used about 6 very ripe bananas. Gluten free bananas breads are usually hard to get the texture right, fluff up and stick together. This did it! It’s not very sweet due to the no added sugar (which I appreciate). I’d much rather top it with peanut butter, jelly, buttery coconut oil etc for added sweetness after it’s baked and it’s really great! I ate half the loaf out of the oven LOL! The streusel had me sold. Next time I may double the stressuel and even add an extra layer! Good job!! Wow this looks great! I’ve never tried recipes with coconut or almond flour but my dad is gluten intolerant so it definitely sounds like something to try. Will definitely make in the future! Hope you’ll give it a try! Thanks Emily. Forget “pumpkin everything” I love “cinnamon everything”. Disclaimer – I actually do love pumpkin everything too, but I have a soft spot for cinnamon. Your food photography and post does an amazing job making this recipe look and sound delicious! I can’t wait to try this! Thank you so much, Christina – I go cinnamon crazy this time of year, too. Hope you love the bread! Hi there, I want to make this but out of coconut sugar, Can I substitute honey or maple syrup? If so same quantity? It might add too much extra moisture…you could try using less banana and using that sub, or sticking to a granulated sugar. This looks amazing (as do all of your recipes)! I’d love to make a loaf for someone with but allergies. Obviously I will leave out the pecans and sub seeds and seed butter, but how do I replace the almond flour? Would a small amount of coconut flour work? Thank you! Of course I meant “nut allergies.” Sigh autocorrect. Hi Jen, yes you should be able to use about 2 tablespoons of coconut flour in place of the almond flour for the streusel. Enjoy!! Really wanted to love this recipe! The cinnamon banana flavour is great, EXCEPT it has an incredibly bitter aftertaste from the baking soda. I was concerned about putting an entire teaspoon in, but decided to cross my fingers and follow the directions. Unfortunately, my instinct was right. These muffins, with an otherwise great flavour and texture, would be perfect if it wasn’t for the baking soda aftertaste! Sad to have used up expensive ingredients for these. Might have to try again without the baking soda. Hi Alena, how odd – I’ve made this recipe and variations on it tons of times (and so have readers) and I’ve never heard that complaint. I tend to use a whole teaspoon of baking soda in a lot of bread recipes like this, otherwise, the rise isn’t great. Sorry that you had trouble. My family loved this bread but i noticed that after 3 days sitting out on counter it starts to mold, even though i do not care for breads in refrigerator should i put it in there to last long? i’ve also heard if it doesn’t have enough preservatives then this could happen, any suggestions on a healthy preservative? or do i put in refrigerator? Hi Juanita, I always keep my bread in the refrigerator because of the moisture in them! I would definitely recommend storing in the fridge for any longer than a day or two to help preserve freshness. I don’t use any preservatives and wouldn’t recommend that. You can always leave a slice at room temperature for 10 minutes or so to help it come to room temperature if that’s how you prefer to eat it. Glad your family loved the recipe!